Positioned on the link road between Gloucester city centre and the M5 at J12 is this small service area. In 1988, Whitbread were planning a "drive-in restaurant" here, which was refused planning permission. Mobil then applied to build a service station with Forte, which opened with the Hardwicke branch of Little Chef. In the 1990s there was a plan to significantly expand this service area, adding a Travelodge, parking, picnic areas, a lake and a new roundabout on the B4008, in an effort to have signs for it added to the M5. Other sites were also looked at, including one on the opposite side of the B4008 and one from Swayfields on the other side of the M5. The Little Chef was closed in 2001, and demolished to be replaced by the McDonald's. 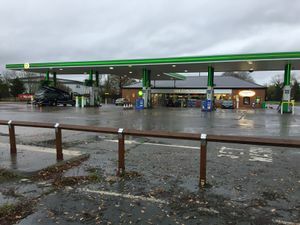 The filling station became an Esso with a Mace store, but in November 2016 it changed to the present BP.